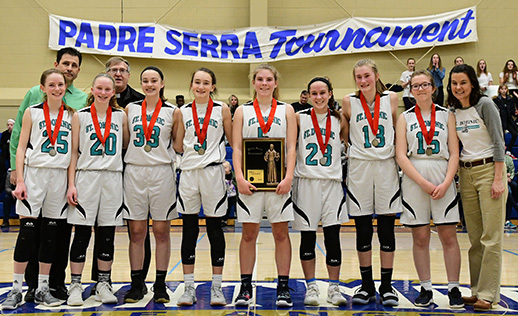 The Padre Serra Tournament - Feel the Power! Congratulations on a Great 2019 Season! 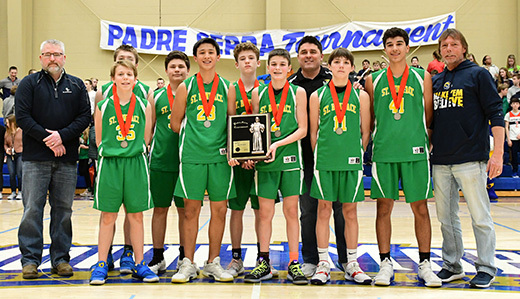 The 2019 Boys Champions: St. Mary's Visitation Gladiators. Congratulations on a great season! 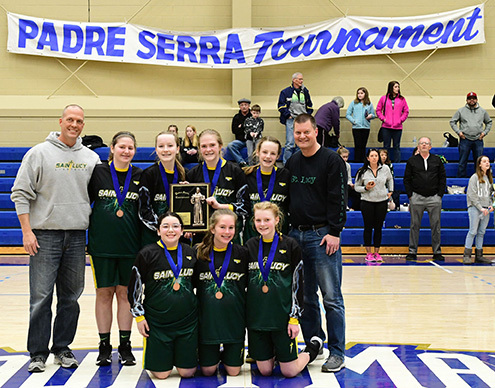 The 2019 Girls Champions: St. Alphonsus Cougars. Congratulations on a fantastic season! All Tournament Boy's Team: #45 - Micki Simi (Christ King), #2 - Danny Staskunas (St. Matthias), #5 - Nate Uselding (St. John Port Wash.), #9 - Peter Stapleton (St. Joeseph's Academy, Kenosha), #14 - Jack Riley (St. Anthony on the Lake, Pewaukee), #23 - Luke Novotony (St. Aphonsus), #3 - Trey Cotey (St. Jude), #32 - Domonic Pitts (St. Lucy, Racine), #5 - Nollenn Tabaska (St. Mary Visitation), #2 - Dillon Walker (St. Boniface), and 2019 MVP #3 - Matthew Schmainda (St. Mary's Visitation). All Tournament Girls' Team: #15 - Haligan Czernecki (St. John Vianney), #24 - Annmarie Murphy (St. Monica/Holy Family), #16 - Lexi Pettit (St. Rita), #12 - Megan Reilly (St. Jude), #12 - Sydney Ludvigsen (St. Lucy), #2 - Taya Christianson (Holy Apostles/St. 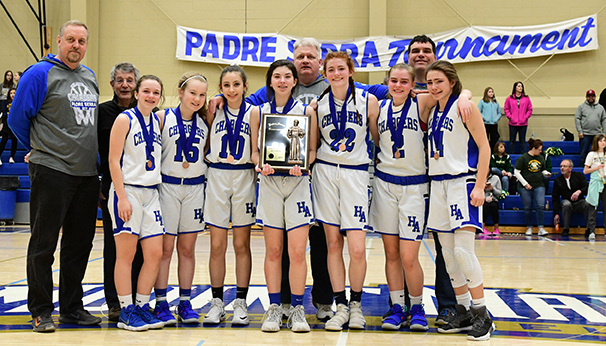 Charles), #5 - Anika Pluemer (St. Dominic), #23 - Maddi Johnston (St. Dominic), #12 - Caitlin Organ (St. Alphonsus), and 2019 MVP #35 - Ashley Lokker (St. Alphonsus). 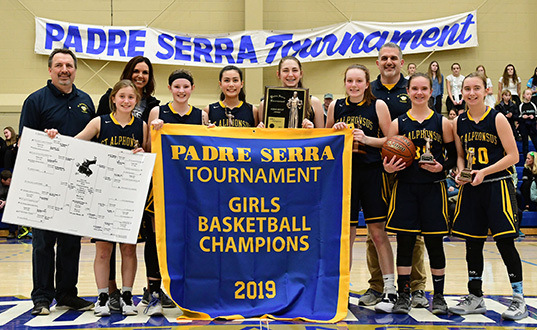 Content on this site belongs to the The Padre Serra Invitational Boys and Girls Basketball tournament. 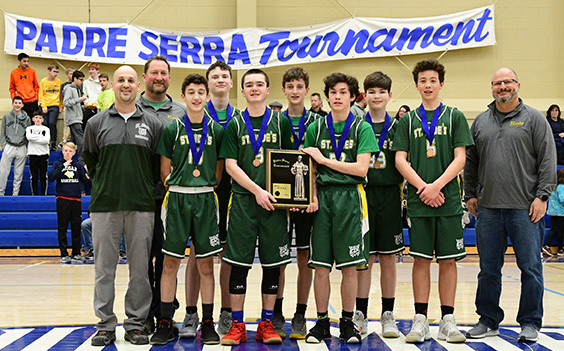 Links to additional sites and content therein is the responsibility of the site owner and is not under the control or direction of The Padre Serra Invitational nor The Serra Club of Milwaukee.